Dominion Connect™ is our customers' direct link to Dominion Diagnostics' Online Services. It provides a secure connection to Dominion Diagnostics for ordering laboratory tests, viewing patient results, accessing practice-specific trend reports, clinical tools and more. 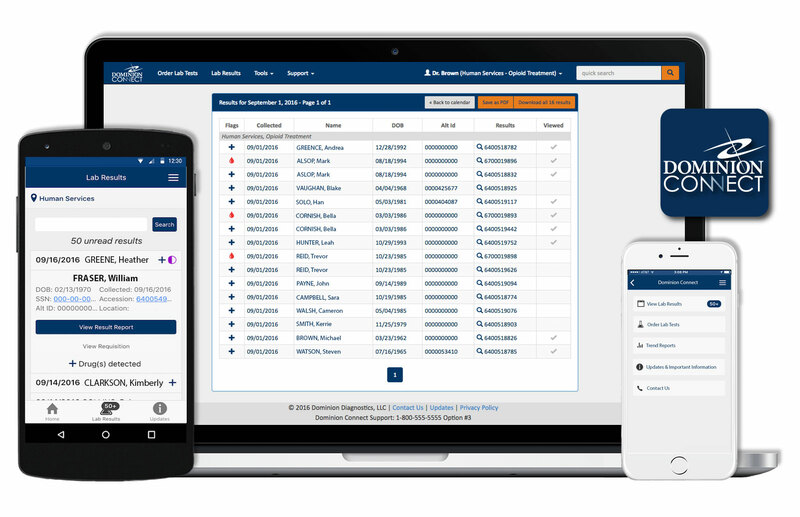 Dominion Connect™ is available free of charge to customers across the country and configurable to meet individual practice workflow needs. Dominion Diagnostics works with an ever-expanding group of EMR vendors all over the country to build custom integrations. Order laboratory tests directly through your EMR and receive standard HL7 or color-enhanced PDF results. Additional vendor costs may be associated with EMR integrations. *Additionally, we have completed integrations with a number of our clients' custom-built EMR systems. Dominion LabSync™ is a custom Windows application that offers behind-the-scenes delivery of results and other data to Dominion Diagnostics customers using secure electronic file transfer.